On top of grassy hills it does not grow as high as its maximum 1.5 to 2m nor on hills much higher than this. Western Gorse [left]. Gorse [right]. 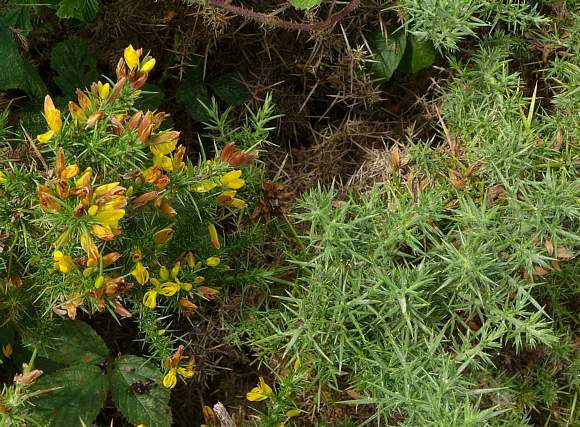 It is September; the paler-green Gorse [right] has flowered much earlier in the year and all its flowers have gone to fruit but the darker-green Western Gorse [left] is in mid-season with some flowers still out (others turning to fruit). Western Gorse [left]. Gorse [right]. 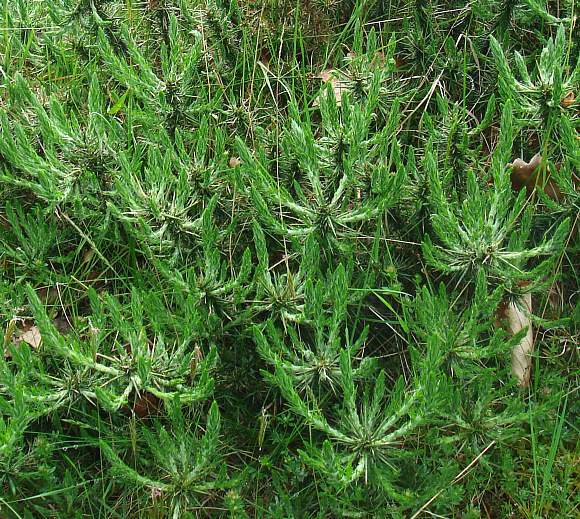 Note the difference in appearance of the spines; on western gorse greener (paler green and slightly longer on Gorse). Western Gorse. Unlike Dwarf Gorse the main spines are rigid but not as sturdy as those of Gorse. 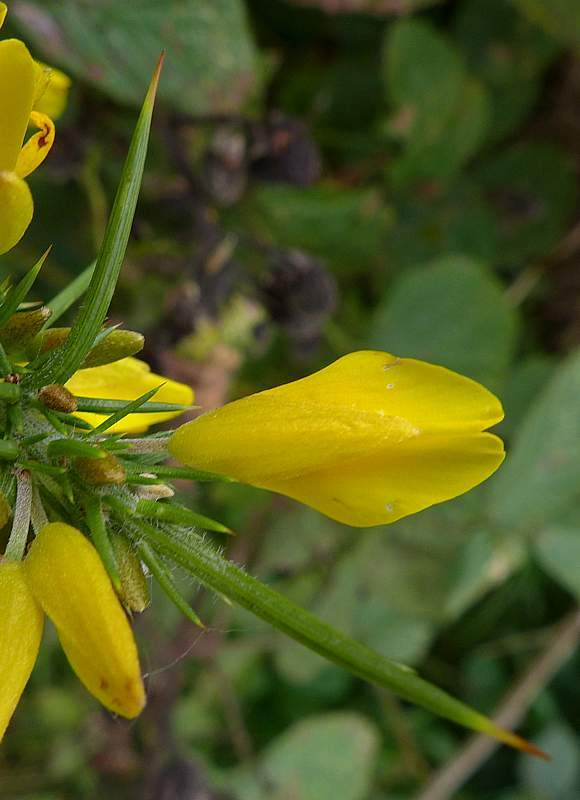 They are also more pronouncedly furrowed than Dwarf Gorse but Gorse has even deeper and more pronounced grooves. Western Gorse. The partially-opened calyxes still enclose the flowers here. Western Gorse. Flowers in all stages of development here from still within their unopened ovaloid calyxes to fully opened flower with withered calyxes pushed aside and the developing brown fruits. Western Gorse. Centre flower -There are two curved filaments each tipped with a cream coloured anther each side of the curved stigma nestling within the keel. LH flower - The more orangy-brown calyx top and bottom of the flower are between 9 and 13mm long - 2/3 to 34 the length of the corolla. There is another but as-yet only partially opened corolla bottom right. The other flowers are still within their unopened orange-yellow corollas. Western Gorse. When straightened out the two wings either side of the inner keel are longer than the keel. The style curls upwards out from between the keel and has two stigma atop. Western Gorse. 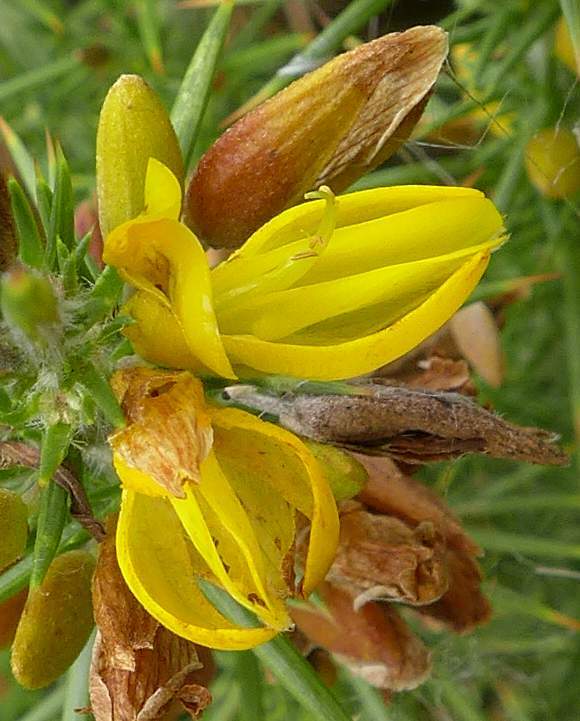 The flowers of Western Gorse are rarely fully opened like this (unlike those of Gorse which usually do fully open). Two cream anthers can be seen on their curled yellow filaments. Western Gorse. The corolla plus banner from above. Note the faint barely-visible pointed tip of the corolla 34 of the way from the end of the larger concolorous diamond-profile banner which is characteristically pinched upwards near the tip. Western Gorse. 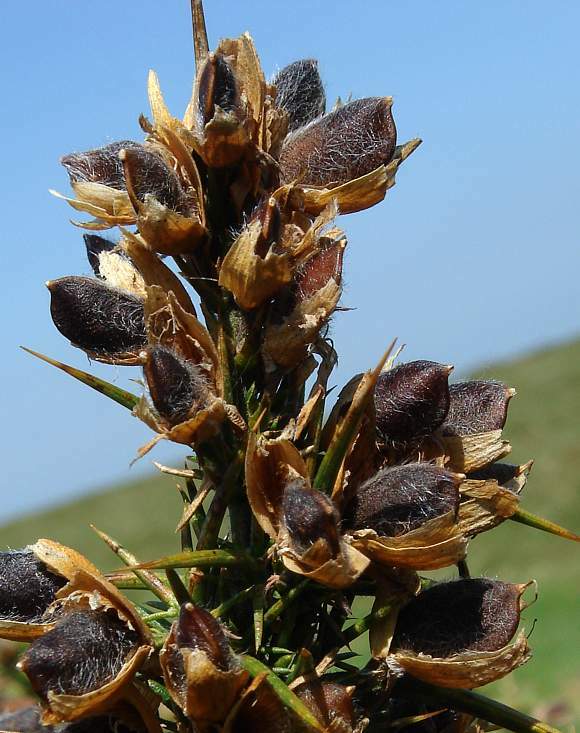 The seed pods are flattish, deep-brown, nearly oval-shaped with pointed tip which once bore the stigmas (still attached on the seed pod at right-hand bottom corner). Western Gorse. 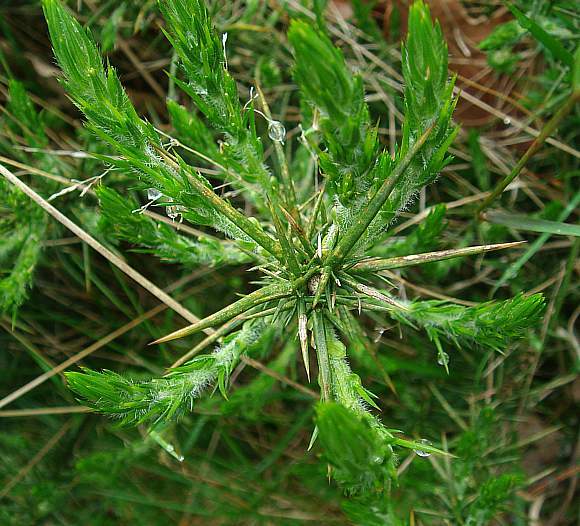 A young plant with branches still establishing. Western Gorse. The branches of spines still developing. Nor to be semantically confused with : Western Mugwort (Artemisia ludoviciana), Western Brome (Ceratochloa marginata), Western Marsh-orchid (Dactylorhiza kerryensis), Western Stork's-bill (Erodium cygnorum), Western Ramping-fumitory (Fumaria occidentalis), Western Sword-fern (Polystichum munitum), Western Clover (Trifolium occidentale) nor the tree Western Hemlock (Tsuga heterophylla) [plants with similar names belonging to differing families]. 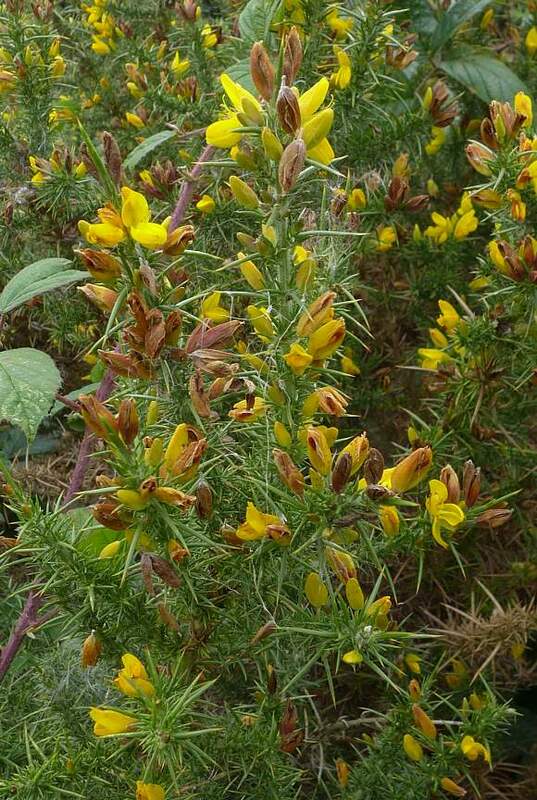 Easily mistaken for : Gorse (Ulex europeaus) but that has more-yellow, less orangey flowers, flowers which usually open wide with the banner shining bright, and has flowers which smell of coconut (unlike the others which are odourless?). 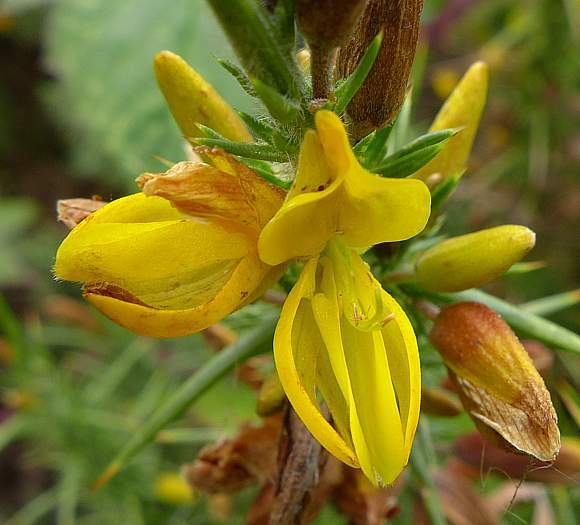 The plant also flowers about 3 months earlier, in the spring, that the other later flowerers, but overlaps can occur particularly with Gorse whose flowers often last longer and into the same flowering season of Western Gorse. 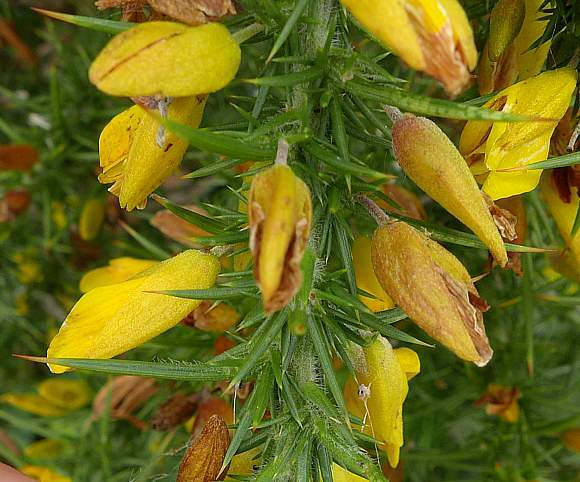 Dwarf Gorse (Ulex minor) (which is a rare [R]) to produce Ulex gallii × Ulex minor which is much rarer than either parent. This hybrid is only found in Dorset, and differs between the two in the lengths of the calyx (8.5mm) and the standard (11.5mm). 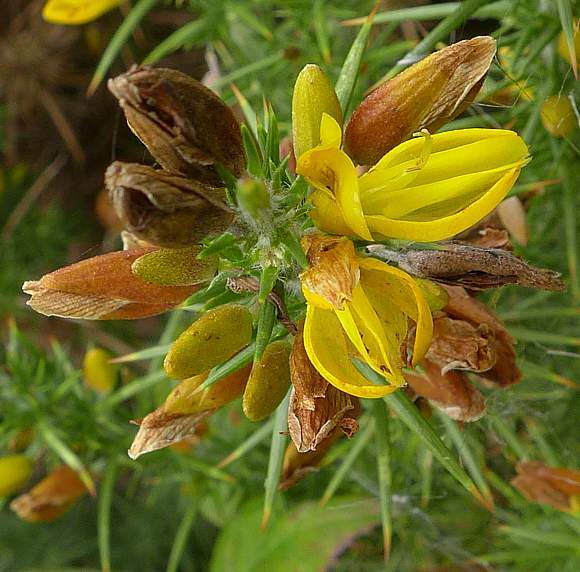 Gorse (Ulex europaeus) to produce Ulex × breoganii which is highly fertile occurs only rarely where the two parents overlap. It is intermediate in character especially in the following features: calyx, corolla, bracteole size and the number of ovules per fruit (between 7 and 10). 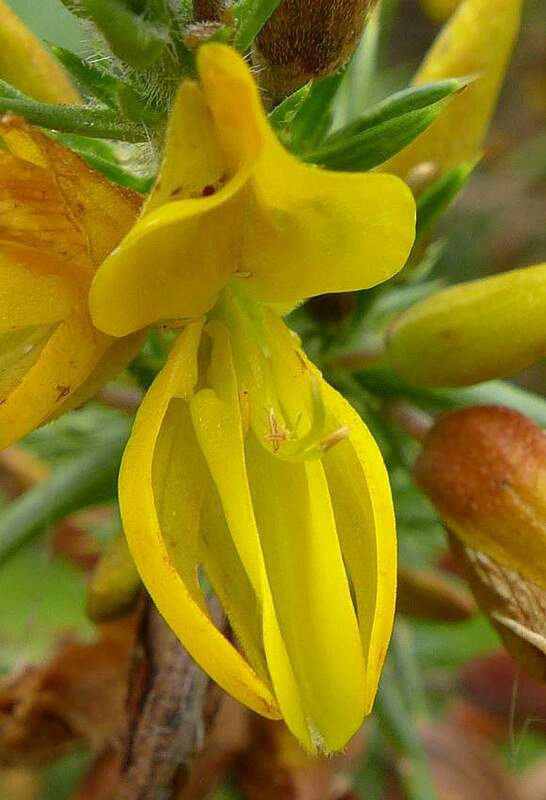 This hybrid flowers in Autumn and Winter. 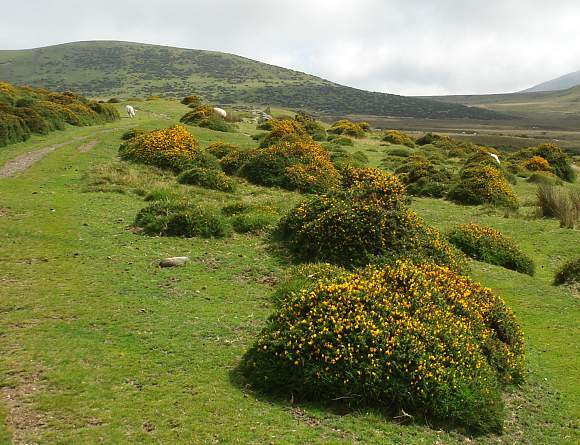 It is a shrub 1.5 to 2m in stature (somewhat shorter than Gorse (Ulex europaeus). 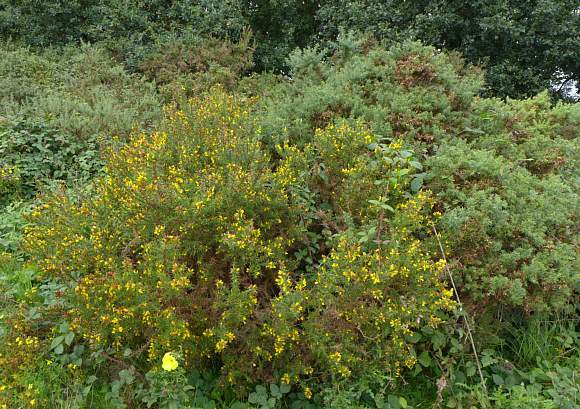 It is the western counterpart to the much shorter Dwarf Gorse. It is native and found mainly in western half of Britain as far north as Solway, and west into Wales, IoM and SW Scotland. Also east to dorset and East Anglia. NOTES: to get any reliable identification, all measurements should be the arithmetic mean of 10 measurements in order to truly differentiate between the three Gorses. But there are some short-cuts. 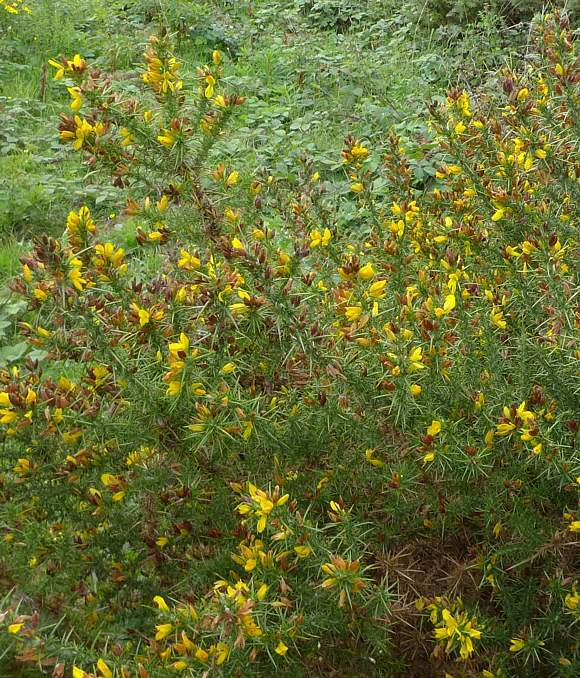 For instance, Gorse is the only one where the flowers smell of Coconut (or so the books imply).